The guys at Venom made a tad bit of a mistake when they forgot to add the correct instructions for their Vibrations Headset XT. But worry not, we can provide you with the correct instructions here. 1. Insert the USB directly into your PS3. 2. Connect both the red and white headset audio connectors into the corresponding audio inputs on your TV. 3. Then connect the PS3 red and white audio connectors into the back of the headset audio connectors. 4. The yellow audio connector is not needed. 3. Then connect the PS3 red and white audio connectors into the back of the headset audio connectors and the yellow video connector into the corresponding input on your TV. 1. On the main PS3 menu go to “Settings” and select > “Accessory Settings” > “Audio Devices” > select “Input Device” and select “USB Ear Microphone”. 2. Then select “Microphone Level” and adjust as required, ensuring the volume indicator just reaches red when you speak loudly into the headset microphone. 3. Press “OK” to save. 1. Insert the USB directly into your Xbox 360. 2. Connect the Xbox Audio Adaptor (sold separately) directly into your Xbox 360, then connect both the red and white headset audio connectors into the corresponding audio inputs on the Xbox Audio Adaptor cable. 3. Finally connect the 2.5mm jack directly into your Xbox 360 controller for chat. 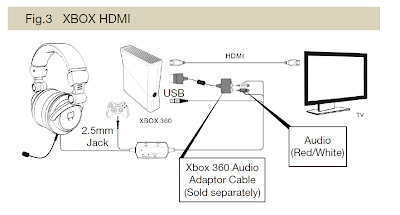 *When connecting with HDMI you will require an Xbox 360 Audio Adaptor Cable for audio output (sold separately). 3. Then connect the Xbox 360 red and white audio connectors into the back of the headset audio connectors and the yellow video connector into the corresponding input on your TV. 4. Finally connect the 2.5mm jack directly into your Xbox 360 controller for chat. 1. On the main Xbox 360 menu go to “Settings” > “Preferences” > “Voice”. 2. Then select “Voice Volume” and set volume at 10. 3. Then select “Game Volume” and also set volume at 10. 4. Finally select “Voice Input” and set as “Play Through Headset”. 1. Simply connect the USB to your PC. 2. Please note: when connected, the Game Volume on the Inline Volume Control Unit is disabled; only the Vibration, Chat and Mute On/Off are functional. 1. Simply connect the USB to your Mac. 2. Go to “System Preferences” > “Sound”. 3. On the “Output” tab select “USB Ear-Microphone”. 4. On the” Input” tab make sure the same “USB Ear-Microphone” is also selected. 5. To control volume adjust the Chat dial. 6. Please note: when connected, the Game Volume on the Inline Volume Control Unit is disabled; only the Vibration, Chat and Mute On/Off are functional. Not the first time a big company has second guessed technical instructions. In all fairness to them it was a minor mistake, but you are right it seems to be common occurrence with the bigger companies. Thanks for this but why didn't venom release this themselves? I think they have, but because we are a seller of the headset, we felt we were obliged to pass on the information. Firstly i do not have a problem with the quality of these headphones but I am giving 1 star to highlight their useless tech support. In their Hitari manual and on their youtube setup video ([...]) they only cater for users who use either an ALL HDMI setup or an ALL Component AV setup. This is not good for users who want to view their games in full HDMI but have NO AUDIO OUTPUT on their TV/monitor! why they couldnt document this i dont know and why their useless tech support didnt know this i dont know either. Instead I had to do my own research and get the answers. Tedious! Thank you for your comment and instruction, we will forward the above concerns to Venom and they shall look into it and get back to us soon. I bought one of these and because i'm using them with ps3 and the xbox 360 microphone lead isn't being used ofcourse, it makes a buzzing noise and only stops if i cover it with my finger, which isn't really a fix is it... Also sometimes makes a tone noise like a non stop beeeeeeeeeeeeeeeeeeeeeeeeeeeeeep. Is this normal for these headsets and just a massive flaw or is it a single fault with just my headset? Please reply coz i'm getting really pissed with every headset i buy fkn not working. Sorry if this is a late reply but please feel free to contact our customer service to arrange for a replacement if the instructions and manual above did not help in resolving this issue. Right, I've purchased this headset and am very happy with it. The only problem I have is the lack of vibration. They are set up correctly, mic works fine, headphones are great sounding but no vibration. Guys, you will need to contact customer service for replacement if you believe the headset is faulty. In this case, I would say it is just you then lol . I think it sometimes depends on the game and the type of sound generated from the games. It would be worth talking to Venom UK directly to find out what they can do to help. If I connect with my pc why the microphone dont work? hello i have one problem :((((...i use venom headphones on another laptop, now i change my laptop better one and my device is not recognite, what can i do? :( please help Florin. I Hate these Headsets, there terrible. They make a horrible Buzzing and a really Loud BOOM Bass sound when i dont have any sound coming out. These are not woth what i payed for! for chat with the headphones does the colour on the headphones and reciever have to red or blue please as i dont know if anyone can hear me in game, thanks! My venom headset only vibrates and the sound is like you hear it from distant room. Im using them with PS4. Can someone tell me what is my problem with this headset? What is it about toys and gamers?